Which varieties are best? Choose your varieties carefully. With a late planting date, it becomes most important that you avoid the huge types like Big Boy, Beefsteak and others. They simply aren’t going to set fruit when temperatures climb above 90. There’s some type of physiological issue that prevents them from doing so, and that same problem stops fruit set when it’s below 70 degrees at night. You’ll be doing well to get five or six fruits from these types that were bred for the Midwest. Thanks to seed company mergers and the ongoing quest for something new, you’ll also find many of your old favorite tomato varieties are no longer available. Carnival, Merced and 444 are just a few of the types that have disappeared from the market. What are the best types? Small to mid-sized fruit. In order of increasing size, your shopping list should include Red Cherry, Red or Yellow Pear, Sweet 100 and other super-sweet types, Porter, Roma, Super Fantastic and Celebrity. Look for stout transplants in 4-inch pots. They should be 6 to 8 inches tall, and they need to be toughened to withstand sunlight and wind. If you’ve already planted tomatoes, and if you don’t have any of these smaller types, you still have time to add a few in. How should I prepare the soil? Set your plants into well-prepared garden soil to which you have added several inches of organic matter (compost, pine bark mulch, rotted manure and sphagnum peat moss, among others). Plant in beds that have been raised by 5 or 6 inches to ensure good drainage should we have extended periods of rainy weather. Set the plants out 42 to 48 inches apart in rows that are 60 inches apart. If you have transplants that are slightly leggy, dig a shallow trench for each plant and plant it at a 45-degree angle. It will form adventitious roots along the portion of the stem that you plant below grade. Water the plants as soon as you have them all set out. What are some key points for growing? Keep the plants off the ground as they begin to grow. Cages you can buy in stores are usually too small for Texas tomato plants. Your plants would probably grow up and out of them before you really started to harvest your crop. It’s much better, instead, to put 5-foot-tall wire cages around every plant. Concrete reinforcing wire works best. Cut it into 54-inch lengths, so that each cage will be approximately 17 inches in diameter. Allow all the “suckers” (branches) to develop, and keep them pushed back within the cages. 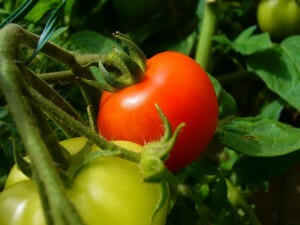 They will shade the ripening tomatoes and protect them from sunscald. You can also grow tomatoes in patio pots, as long as they’re large enough to allow normal root growth. In most cases, that will mean 7- or 10-gallon pots, and you’ll want to fill them with a lightweight, highly organic potting soil. Remember that potted tomato plants will dry out much more quickly than their in-ground counterparts, so prepare to water them frequently. Tomatoes that are allowed to wilt badly, whether in pots or in the ground, will typically develop blossom-end rot. The ends of the fruits away from the stems will have brown, sunken spots that will ruin the fruit quality completely. What about pests? The prime pests of spring tomatoes, in order of their appearance, will be aphids, early blight and spider mites. Aphids are already showing up. They’re small pear-shaped insects that congregate on the newest growth. They’re not the worst pests you might encounter, but you’ll still want to keep them washed off with a hard stream of water. You can also eliminate them with most general-purpose insecticides that are labeled for vegetables. Early blight usually shows up in mid-May. Thumbprint-sized, bright yellow blotches show up on the bottom-most leaves. Left unchecked, it then spreads up the stems. Keep the foliage as dry as you can, and apply a labeled fungicide to stop its spread. When grooming your plants, take care not to carry the fungal spores to healthy plants via your hands. Spider mites typically appear about three weeks after you see early blight, so that usually means mid-June in our part of Texas. Lower leaves will have fine light tan mottling, and the discoloration will quickly spread up the stems. By the time you see fine webs between the leaves, you will have waited too long. If you want to confirm early outbreaks, thump a suspect leaf over a sheet of white paper. If you see tiny specks starting to move about freely, those are the mites. Most general-purpose insecticides will offer some degree of control. This entry was posted on Wednesday, April 4th, 2018 at 12:08 pm	and is filed under Garden, News & Updates. You can follow any responses to this entry through the RSS 2.0 feed. Both comments and pings are currently closed.